We're pulling the shutters up now. Thanks, as per, for your company and contributions. We're back with you tomorrow from 14:30 BST to build up to the fourth round of F1 2015. Lights out (under the lights) at 16:00 BST. Last year's race saw a brilliant fight for victory between Lewis Hamilton and Nico Rosberg. Will the two serve up something similar, or will those racy Ferraris elbow in on the action? We'll have all the answers for you tomorrow. Calixto Érico: Nothing. He is simply up against three incredible pilots. 7 World Driver Championships & 95 wins between LH, SV & KR. Mike Smith: I think the new communication rules favour Lewis a lot. Rosberg was always looking for advice from the team where Lewis just drives. Rudi: He is a very good driver but in his head he is THE best. Can't stand to lose so often from his team mate, it destroys him. Anne Kingston: Unless he has a quick session with a sports psychologist he has already lost the mental battle and thus the confidence. Sam Elliott: Outclassed, out-thought, out-driven. A good driver but not a great driver. Lewis too strong. Neil: In his head, he's already beaten. Every time, LH just that bit faster - and he doesn't seem able to handle that. Ride on board as Lewis Hamilton takes his fourth consecutive pole position of the season with a lap of 1 minute 32.571 seconds. Alex Ball: I think Nico has had it, bye bye race win. Ian Brown: Strange comment from Rosberg - he was saving tyres & was surprised at his slow pace. Is the aim not to be 1st? Blake: I wonder what excuses he's going to make now? What was that, Lewis not quick enough? McLaren's Jenson Button remains positive about his weekend despite suffering a third car failure of the weekend in the first part of qualifying. Button's car suffered electrical problems in both practice sessions on Friday and the 2009 world champion thinks it was the same fault which ended his qualifying session early. He says the car was nevertheless "enjoyable" to drive in third practice and is looking forward to the race on Sunday, for which Button will line up 20th and last. Coming into this weekend, Mercedes' Nico Rosberg made it clear that he needed to turn the tide in his battle with Lewis Hamilton for the world title. Yet on the evidence of today's action, the gulf between the two arguably looks bigger than ever. Having taken pole in Bahrain each of the last two years, this was a track Rosberg would have targeted as an opportunity to fight back. But instead Hamilton took his fourth pole of the season, leaving his team-mate trailing half a second in arrears. Rosberg said he under-estimated the Ferrari's speed and that he lacked rhythm. But is this just part of a more worrying trend? Sauber on Twitter: We might be up for a nice fight between Mercedes and Ferrari tomorrow! And we will #PushForPoints. Nico Rosberg: P3 - 1:33.129: "Strategy wise I got it wrong. I was thinking too much about the race and I under-estimated Sebastian's speed. I took it easy in Q2 to save the race tyres, so I lacked the rhythm for Q3. That's where I went wrong today. Being third is not ideal." Sebastian Vettel: P2 - 1:32.982: "First of all I am very happy with second place. It was a tough session and I didn't find the rhythm I had in practice at the beginning but felt more comfortable near the end. Hopefully we will have good race tomorrow." Lewis Hamilton: P1 - 1:32.571: "I feel great. I feel very happy. Obviously coming in to the weekend that was the target to master the track and get the car into an area that I'm happy with. I'm really grateful to have this beast underneath me to attack these corners. "They (Ferrari) are very quick this weekend. They're going to be very hard to beat this weekend hopefully our positioning helps. I think were in a good position. Looking forward to the fight." Here's a highly unlikely stat, but one which is, we are assured, quite true. The opening weeks of the 2015 season have delivered a notable first in the sport, as for the first time ever the same drivers have filled the top three places at the first three grands prix. Yep, seemed unlikely to me too but there you have it. Today's top three qualifiers - Lewis Hamilton, Nico Rosberg and Sebastian Vettel - are the three history-makers. They are perfectly placed to make it four in a row on Sunday. Just to say we'll have reaction from the top three in the next few minutes. Mercedes on Twitter: YES! 1:32.571 for Lewis and it's POLE! P3 for Nico in 1:33.129. What a lap from Lewis Hamilton! It was never really in doubt from the moment he punched in that 1:32.6 in Q2, was it? Moments after Vettel went quickest and Rosberg failed to displace the Ferrari, Hamilton swept across the line to post a time of 1:32.571 and with it take pole. The Briton takes top spot by 0.411s from Vettel, and 0.558s ahead of Rosberg. That's Hamilton's first pole in Bahrain. 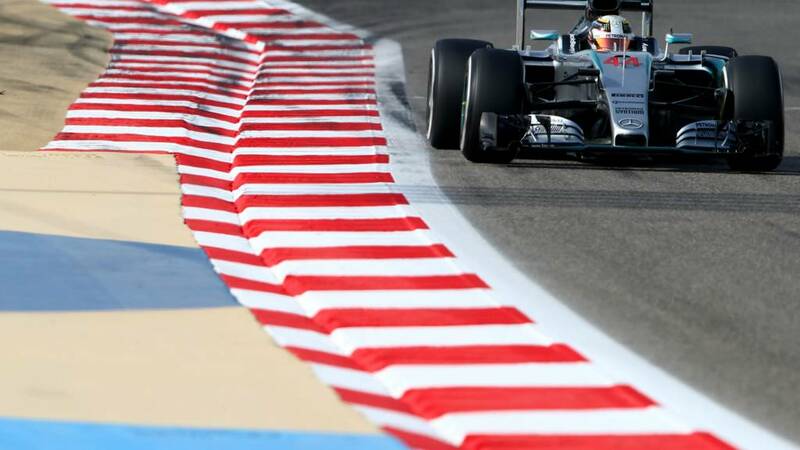 LEWIS HAMILTON TAKES POLE POSITION FOR THE BAHRAIN GRAND PRIX. Rosberg cannot beat the Ferrari man and has to settle for second for now... but here comes Hamilton. The Ferrari of Vettel takes pole as the flag comes out. A 1:32.982. Ricciardo, in second place at the start of these final runs, does a 1:33.8. He's still second. Vettel has done a purple first sector on his lap though. Right, we're shaping up for final runs. Three minutes to go. Ricciardo is the first man to go out for his final flyer. Hamilton will be the last man across the line after the chequered flag falls. Hamilton, Ricciardo, Rosberg, Bottas, Vettel, Raikkonen, Massa, Grosjean. Hulkenberg and Sainzo still to break cover. Hamilton is now on top with a 1:33.522. Of course that is not even in the same league as the 1:32.6 he did in Q2 so more to come that Mercedes. A good time from Daniel Ricciardo. He's on provisional pole for Red Bull on a 1:33.850. A 1:34.522 puts Vettel top of the early standings. His team-mate Raikkonen, also on the scrubbed softs, goes fractions slower. His team-mate went out in Q1, so Daniel Ricciardo has already won the Red Bull battle today. What can he do in the top-10 shootout? Toro Rosso on Twitter: And this is how focused Carlo Sainz looks right now. Q3 about to start!! Let us see some more of that magic, Carlos! The top-10 shootout is under way. Your protagonists are: Hamilton, Raikkonen, Massa, Vettel, Rosberg, Bottas, Grosjean, Ricciardo, Hulkenberg, Sainz. Sauber on Twitter: Good effort by our guys. P12 for Felipe, P13 for Marcus. Force India on Twitter: P9 for Nico with 1:34.613 - he moves on to Q3! Checo will start in P11 tomorrow, he's given himself a big chance for points. It was always going to be too much to ask, but with Fernando Alonso driving there was always a chance. In the end, the McLaren driver had to make do with 14th place. Joining the Spaniard in elimination are Sergio Perez, Felipe Nasr, Marcus Ericsson and Max Verstappen. Impressive late laps from Carlos Sainz of Toro Rosso and Force India's Nico Hukenberg see them safely into the top 10. Jeremiah Kariuki: Where is Lewis getting these lap times! That's massive! Andy Moakes: Hamilton's lap was mighty again, who can stop him. Kellan Jensel: WOAH!!! 1st in the 1min 32s. Jenson Button tells BBC Radio 5 live: "It was a power cut, don't know where it came from. It's a shame because after FP3 we thought the car was doing pretty well." Lewis Hamilton leads the way on a 1:32.699 at present. Yes, a 1:32.6. That is the small matter of 1.2secs faster than his team-mate! Hamilton's nearest challenger is Williams' Felipe Massa - 0.882s back. "To get into Q3, by my calculations a 1:34.8 will be required." No one in a hurry to venture out in Q2. The Force India of Sergio Perez blinks first and he's on to a hot lap on soft tyres. James Weir: Love seeing the sparks flying from the cars with these night races. Michelle Holland: Loving the sparks flying off the cars at Sakhir. It's beginning to feel a lot like Christmas! All twinkly! Ben White: All these sparks remind me of my first Scalextric set! Darryl Evans: I think McLaren are quite entitled to a refund now Honda. Rich Atkinson: My old Rover25 is more reliable than the McLaren MP4-30! Embarrassing! Daniel Button: McLaren are shocking. The amount they have spent yet can't even get Jenson to finish a lap. A big surprise. Lotus driver Pastor Maldonado has looked good all weekend but he has neverththeless found himself eliminated in Q1. Also out is Red Bull's Daniil Kvyat, who spun in FP3 earlier and on the whole hasn't looked on it this weekend. The Manors are out - Will Stevens ahead of Roberto Mehri - while Jenson Button will start last. Alonso is ninth as things stand and he's into Q2. Still a lot of drivers on hot laps. Good stuff from Williams. Bottas is second, two tenths off Hamilton, and Massa fourth. The Ferraris had briefly displaced the Mercedes from the top of the pile on the softs but the Mercedes have come roaring back. Rosberg went top but Hamilton upstaged him with a 1:33.928. Three minutes left and the drivers in danger of elimination are: Verstappen, Maldonado, Stevens and Merhi. Button already gone. Any talk of Mercedes and Ferrari going though this first part of qualifying without using the soft tyres can be forgotten. They are all out there on the yellow-walled tyre now. So it's all down to Fernando Alonso now if McLaren are to make it into Q2 for the first time this season. He's ninth at the moment but won't stay there. "The good news is Button will only starts one row back from where he started the first three grands prix." Another miserable turn of events for McLaren's Jenson Button. He's crawled to a halt on his out lap. He also hit trouble early in FP1 and FP2. McLaren boss Ron Dennis slaps his flanks in frustration in the garage. Goodness knows how Button is feeling. "Dear oh dear. What a nightmare he is having this weekend," says BBC commentator Ben Edwards. The early laps are being punched in now and it's Mercedes' Nico Rosberg out front. He's done a 1:35.657, three tenths ahead of team-mat Lewis Hamilton. Kimi Raikkonen: "OK, I have a lot of vibration, so I'll box this lap." That vibration came from a big lock-up by the Ferrari driver as he went into turn one on his first hot lap. He's fifth of the five cars to have completed a lap so far. Engineer to Lewis Hamilton: "It looks like it's calmed down but there are still some big gusts." Gusting winds proved troublesome for the drivers in FP3. Eddie Jordan's chat with Ferrari boss Maurizio Arrivabene over on BBC TV has gone down very well with you guys. Chris: Absolute legend, what a guy Maurizio Arrivabene... I'm watching far too much F1 lately just hoping for a Ferrari resurgence. Callum Rowe: Yep. I'd call him a dude. Elton Lam: Maurizio Arrivabene speaks sense. @ScuderiaFerrari's upturn in form is good for the sport and competition. First man out is Ferrari's Kimi Raikkonen. Lotus on Twitter: We're on the countdown to quali & the fairy lights have been switched on. We're very excited about that. Arslan Malik: Ferrari can get the front row it's not out of the question but their long race pace look strong this good Ferrari have stepped up. Neil Perry: Got a sneaky feeling Button will sneak into Quali 2 this time around. Grant Bolters: Mercedes are not going to have it all their own way. Certainly Ferrari duo will fight them for that front row. Felipe Massa on Instagram: With love I get into my room and I see this. Thanks so much. "Frank's attending his first race of the year - and loving it. Here he is watching pit stop practice." April 1942 - something in the water? Just by way of a follow-up to the Jochen Rindt entry, it's interesting to note that three great names of F1 were all born within a few days of each other in the spring of 1942. Team owner Sir Frank Williams was born on 16 April 1942 in South Shields, while Rindt was born in Mainz, Germany, just two days later on 18 April. Just the usual request for your predictions ahead of qualifying please. You can get in touch on this or any subject via #bbcf1. Jochen Rindt, F1's only posthumous world champion, would have turned 73 today. The Austrian raced for Cooper, Brabham and Lotus in a curtailed 60-race career that began with an outing in a Rob Walker-run privateer Brabham at his home race in 1964. He won six races, five of those coming in his title-winning season with Lotus in 1970. Rindt was killed, aged 28, in practice for the Italian Grand Prix at Monza. Although four races remained in the season, no driver could overhaul Rindt's points total and he was crowned champion by five points from Jacky Ickx. While his pole record here ain't great, Hamilton is nevertheless bidding to become the fourth man to win back-to-back races in Bahrain this weekend. One of the talking points in China a week ago was Lewis Hamilton's achievement in earning a fifth pole position in Shanghai. It's fair to say the Bahrain International Circuit has not been such a happy hunting ground for the Mercedes man, with zero poles from seven previous attempts. Can he break his duck today? "Mercedes always seem to find that bit extra in qualifying, but Vettel looks a serious contender for pole in Bahrain. And if he can challenge in qualifying, Mercedes will have serious concerns about what the Ferraris can do in the race on Sunday. Hold on to your hats." Covered in crumbs and doomed to indigestion, the BBC live text team is back with you. Sixty minutes until qualifying for the Bahrain Grand Prix begins. Mercedes or Ferrari on pole? Who's your money on? OK we're going to wrap up for half an hour now. Thanks for your company and contributions so far. We'll be back with you at 15:00 BST for the build up to qualifying, which gets under way under the lights at 16:00 BST. In the meantime, have a gander at Andrew Benson's FP3 report. Adrian Matthews: People seem to have forgotten how boring the Bridgestone races got. Pirelli are only doing what they've been asked to. Mike Ellis: Honestly think Webber's wrong, actually more skillful to manage things than just drive fast! Just Mick: Pirelli now get tyres right more often than not. I don't want 3 and 4 stops, but tyre strategies create battles throughout field. Colm: The way she makes that sandwich, layer after layer... Each perfect. Can't wait for lunch lads, what about you Fernando? Alex Pettitt: So if you don't get the car working, I'll be ripping your pay cheque into tiny pieces just like this. Paul: You know what this is? This is the smallest violin in the world playing just for you. McLaren on Twitter: As FP3 came to a close Jenson Button set a 1:36.488 and finished P11. Williams on Twitter: Felipe has a quick chat with Frank as the session ends. Force India on Twitter: A good session for us with Nico in P9 (1:36.421) and Checo in P15 (1:36.727). Very close in the midfield! FP3 final standings: 11 Button, 12 Kvyat, 13 Ericsson, 14 Verstappen, 15 Perez, 16 Alonso, 17 Sainz, 18 Grosjean, 19 Stevens, 20 Merhi. That's an encouraging performance for Jenson Button after yesterday's problems. Green shoots at McLaren? FP3 final standings: 1 Hamilton, 2 Vettel, 3 Rosberg, 4 Raikkonen, 5 Bottas, 6 Massa, 7 Maldonado, 8 Ricciardo, 9 Hulkenberg, 10 Nasr. Hopes for a real battle for pole and victory are alive and kicking after that session. Kvyat's late lap on the softs was the only issue to resolve in those final moments of practice. The Red Bull man goes 12th. There's frantic work going on at Red Bull to get Danill Kvyat's car out for a hot lap on the softs after his earlier spin. OK, three minutes to go. Order is Hamilton, Vettel, Rosberg, Raikkonen, Bottas, Massa. Ray Skudder: And if you twist your hands to your face, you become a Superhero! Aron Bell: This is the amount of points we will get this weekend! JPBoutros: Needs 'punch', not 'pinch', Ron. Lewis Hamilton's Mercedes has just gone quickest with a time of 1:34.599 - 0.3s quicker than team-mate Nico Rosberg. The Ferrari of Sebastian Vettel slots into second, just 0.069secs off Hamilton. Force India's Nico Hulkenberg is the first to blink on the yellow-walled rubber and goes fastest with a 1:36.421. The Mercedes of Nico Rosberg is also on the soft and is on his out lap. We're going to see times coming down now. Jenson Button: "It feels like we had downgraded power on that lap." Button is sitting 10th at the moment and escaping the reliability issues that dogged his progress yesterday. All times at the moment are being set on the medium tyre. Since we're all agreed the times in this session aren't going to tell us an awful lot, maybe we should take this chance for a quick caption competition. What wisdom might be being imparted here? Red Bull cleared. Back out there lads. "There's a sensor issue on Fernando Alonso's car. He missed the first 15 minutes of the session because the car wouldn't start. "They won't elaborate as to what the problem was. They're still trying to get on top of it." They're going to have to get the JCB out to remove that Red Bull so the red flag is flying. The Red Bull of Daniil Kvyat has gone off through turn four. The young Russian looked well in control as he kissed the apex of the corner but the rear end got away from him and he spun, before rolling into the gravel on the opposite side of the track. As BBC commentator Allan McNish rightly observes: "The thing he'll be kicking himself about is rolling back into the gravel, which seemed unnecessary." "That dust is not helping cars and neither is the wind. We've just had a gust of 20mph, which will not be helping these cars." As it's hard to show the effect of the wind in Sakhir today, the hair of Williams development driver Susie Wolff will have to do the job instead. Fraser Dart: I think that tyre management is one of the things that keeps F1 exciting, but I would like to see PROPER racing. Schniges: It kills the sport and makes it boring. We wanna see lap records being broken not Sunday afternoon drives. Christopher Smith: Make it compulsory for two pitstops in races and give the drivers more rubber to push 100%. Not entirely sure was it is at this stage, but Pastor Maldonado's car has just shed a considerable piece of its bodywork. Lewis Hamilton just missed his braking in a big way at turn one. He wasn't even close to making that one! Luckily for the Mercedes man there's a hefty acreage of run-off area down there and he continues on his way. Nico Rosberg goes fastest for Mercedes with a 1:37.599, but quickly radios back to the team to report "a bit too much understeer at the moment". Red Bull best of the rest? "An early indication of form beyond the top three is as follows: Red Bull look about the fourth fastest team in both qualifying and race trim, but then so they did in China, only for it to go very wrong in the race. Lotus are then in a close fight with Sauber - Pastor Maldonado's race-sim run was just 0.06secs on average faster than Felipe Nasr's, with the Toro Rossos after that. "Fernando Alonso's race run for McLaren was 0.8secs off Maldonado/Nasr, but unfortunately for McLaren still slower than the Force India of Nico Hulkenberg. "As you were, in other words." Hamilton's derriere - as was the case in China and Malaysia - is getting toasty warm in that Mercedes again. Dhiren Khandel: Hardly relevant to the real world and holds back talented drivers. They should always be on edge. Stuart Hatto: It's time to make a tyre that goes the distance with manual gearboxes - then we will get decent racing. Allie: Maybe they need to get Bridgestone back. They manage to give Indycar soft and hard tyres without it being all about tyre management. Jenson Button: "I've no rear grip at all. Traction is very poor." "It was all smiles at Williams on Friday. Valtteri Bottas was in fifth place just 0.03secs slower than Ferrari's Sebastian Vettel and head of performance engineering Rob Smedley called it a 'really good day', on which the team were 'where we expect to be with regards to both high- and low-fuel runs'.
" At the beginning of the season, that would have meant on a par with Ferrari. Now, expectations recalibrated, it means a bit off them but ahead of everyone else - Bottas was 0.5secs off the Mercedes in race trim on Friday. But both he and Felipe Massa, who had a difficult day unhappy with the balance of the car, will have hopes of splitting the Ferraris on the grid, as they managed in China last weekend." Just a word to the wise on this session. Don't forget that yesterday's opening practice - run at a similar time of day - failed to give us any truly useful information about what to expect in the race. To underline that fact, the Mercedes were 15th and 16th. With qualifying and the race set to be run under lights and in cooler conditions, there is only so much that the teams can learn from blasting around in these higher temperatures. We're up and running in final practice for the Bahrain Grand Prix. Just on that Mark Webber tweet, do you think the former Red Bull driver has a point? Has "extreme tyre management" become too much of a feature of F1 and other series? It was certainly key to Ferrari's win in Sepang and is very much a topic of conversation in Bahrain. Your thoughts via #bbcf1 please. Mark Webber on Twitter: Blood's boiling watching most single seater categories including F1 become completely dependant on extreme tyre management. Let drivers push. McLaren-Honda racing director Eric Boullier described yesterday's practice sessions - which saw Fernando Alonso run reliably and Jenson Button hit trouble in both sessions - as "a game of two halves". "It's too early to say where we are, pace-wise, but Fernando's best FP2 lap-time was 1.5s off Nico's Rosberg FP2 benchmark. That isn't where we want to be. Having said that, I believe it demonstrates that our progress, although not always linear, is nonetheless directionally positive overall." "No, no no. It's 'linear'. L-I-N..."Image caption: "No, no no. It's 'linear'. L-I-N..."
Red Bull Racing on Twitter: Anyone for an arm wrestle? Place your bets! Horner. Has to be Horner. Manor driver Will Stevens on Twitter: Pretty solid first day! Pace is looking strong & really nice to drive in the night again! Get some cool shots! "The Ferrari threat to Mercedes is real, but it has to be said that it looks like something does not quite add up. The Mercedes had at least half a second over the Ferrari on one lap on outright pace - and if both Lewis Hamilton and Nico Rosberg had 'scruffy' laps, as Rosberg put it, so too did both Ferrari drivers. It doesn't really make sense, then, that the Mercedes can then be 0.6secs on average slower on a race run. "It's hard to believe that there could be a swing of more than a second between the two teams between qualifying and race - or that Mercedes could be that far off in race trim a week after an ultimately comfortable win in China, in which Hamilton clearly had plenty in hand when he needed it. "Equally, Hamilton did his main race run on the mediums, and when he switched to the soft tyres late in the session he did two super-quick laps - a 1:39.3, which just under 0.1secs slower than Vettel's fastest lap on his race run, and then a 38.6, 0.3secs quicker than Vettel's best race-run lap. Perhaps Mercedes over-did their care with the tyres and were running them out of their temperature window. This promises to be a fascinating weekend." BBC Sport has sat down for a chat with the two men who between them have won the F1 world title in six of the last seven years. Lee McKenzie had the task of putting the questions to Lewis Hamilton and Sebastian Vettel and you can see the result in the pre-race programme on Sunday. Just to bring you up to speed on the various investigations that sprang up from yesterday's second practice session. No driver was deemed at fault in the first-corner collision between Ferrari's Sebastian Vettel and Force India's Sergio Perez, although a reprimand was given to Vettel's team-mate Kimi Raikkonen for an infringement when leaving the pit lane. Mercedes' Lewis Hamilton also crossed a white pit-line limit line but escaped any action. "Well, if the truth lies therein this weekend, Mercedes have a real problem on their hands, for Vettel was 0.6secs quicker on average than Mercedes' Nico Rosberg on the race-simulation runs on the soft tyre. Mercedes are under no illusions about what that means. 'Ferrari are way too quick for our liking,' Rosberg said. 'We have an edge over Ferrari in qualifying so there for sure we will be one and two, I think, but the race is more problematic.'" Hello and welcome along to our live text commentary of third practice and qualifying for Sunday's Bahrain Grand Prix. Mercedes' Nico Rosberg finally got the better of team-mate Lewis Hamilton yesterday as he posted the quickest time in FP2. Both Silver Arrows drivers were once again required to keep a close eye on the Ferraris, who led the chasing pack in third and fourth. Battle will be joined between the two front-running teams again today, with Rosberg conceding after second practice that "the pace of the Ferraris is very worrying". Enough to worry the Mercedes off the front row? Well, it's a stretch but stranger things have happened. Here's a picture to sum up the 2015 season so far. A Mercedes hoons around the track with a scarlet Ferrari in hot pursuit. Meanwhile, a McLaren-Honda lurks unhappily in the back of frame, its world champion driver with much to ponder. Will the familiar narrative continue through final practice and qualifying today?